Bootstrap your network: Construct your network from a topology diagram, add protocols, automatically allocate IP addresses, and generate configuration files with templates. 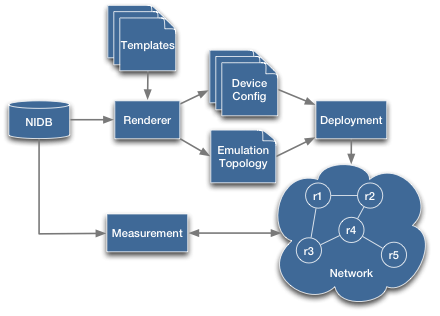 Deploy to emulated networks and measure the results, with live visual feedback of design and measurement steps. Draw your network in a visual editor such as yEd. Add attributes such as device type, ASN, link speeds, or OSPF costs. Build networks from these attributes. Protocols such as BGP and OSPF can be designed at a high level, using attributes such as device type and ASN. Work with native Python syntax. (and measurement) AutoNetkit includes scripts to push generated configurations to emulation platforms such as Netkit.